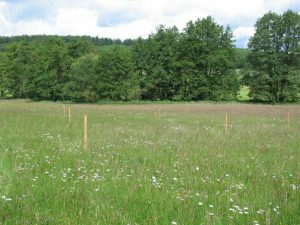 This periodically wet “Lowland hay meadow” (NATURA-Code 6510) in a good state of preservation in the floodplain of the Eisenbach rivulet is used for making hay, in some years the area can be cut twice. It is situated close to the Auhof farm near Frischborn and not far from the site of the demonstration plant. The vegetation is dominated by Festuca rubra, Agrostis capillaris, Trifolium pratense and Leucanthemum ircutianum.